The state government is investigating various property deals undertaken by Dera Sacha Sauda in Maharashtra. According to officials in the state revenue department, land purchases by the dera over the past eight to 10 years are being examined in the wake of the shooting incident where dera men killed one person at a shopping mall here. Activists of the Vishwa Hindu Parishad block road near the Jammu and Kashmir House during a demonstration on the transfer of forest land to the Amarnath Shrine Board, in New Delhi on Saturday. Pakistan foreign minister Shah Mahmud Qureshi has claimed that India and Pakistan were close to resolving the Siachen issue, adding that finding a solution to the Sir Creek issue was also possible. Adopting a “wait and watch” policy on the unfolding developments in Srinagar, the UPA government and the Congress have decided to await Governor N.N. Vohra’s decision on the People’s Democratic Party (PDP) decision to pull out of the coalition government in the state. Vice-President M. Hamid Ansari today regretted that corruption in India had become pervasive and cancerous, weakening the nation’s resolve to usher in inclusive growth that covers all the marginalised and vulnerable sections of society. The Wage Board for journalist and non-journalist employees of newspapers and news agencies today recommended an interim relief of 30 per cent of the basic pay from January this year. One of India’s top nuclear scientists and principal scientific adviser to the Prime Minister Dr R. Chidambaram has expressed satisfaction at the use of nuclear technology to recharge water springs in the Himalayan region. In a bid to abet disaster management of soil erosion, the Indian Institute of Technology, Roorkee, has taken up a task to devise method to predict soil erosion that has been increasingly posing serious threat to the ecology. India has a thousand neurologists for a population of one billion plus. This alarming figure cited by the Indian Academy of Neurology (IAN) means that there is only one neurologist per one million, which is way below the internationally recommended neurologist- patient ratio. At least 35 persons, including 15 policemen, were injured in a clash in the old city here over the alleged encroachment of a piece of land near Jama Masjid, following which curfew was clamped in the Sadar area. A Mumbai-bound Jet Airways flight from Delhi with about 100 passengers on board had to abort landing at the last minute as another aircraft was parked on the same runway. The big cat is back in Sariska, four years after it was poached out of existence in the sanctuary. In a first of its kind operation in India, a three-year-old radio-collared male tiger was today airlifted to Sariska from Ranthambore National Park in Rajasthan. The officials say the dera has at least six properties in different parts of the state. Some of these ashrams comprise of vast tracts of land measuring as much as 150 acres. The properties owned by the dera include a sprawling ashram at Khopoli on the outskirts of Mumbai, an ashram at Nanded and agricultural land in Satara. Complaints filed by leaders of the Sikh community allege that the dera has taken advantage of “loopholes” in rules prohibiting the purchase of agricultural land by non-farmers. Charan Singh Sapra, a member of the Maharashtra Legislative Council, who led the protests against dera chief Gurmeet Ram Rahim Singh following last week’s shooting incident, says the dera has purchased properties in the name of its followers who are said to be farmers from Punjab. “The authorities must investigate the dera's sources of funding for purchasing such properties,” Sapra said. One of the biggest ashrams of the dera in the Kalote village of Khalapur near Khopoli is now under investigation for illegally using agricultural land for non-agriculture purposes. Though local officials had many times issued notices to the dera for building an ashram on 20 acres of farmland without permission, the authorities have been going slow against it for fear of offending religious sentiments. According to police sources, the ashram attracts scores of dera followers who stay in the quarters constructed at the ashram, where the dera has also started dairy farming. The dera had reportedly offered to pay a penalty to the state government to get the constructions regularised, but the proposal failed to materialise. 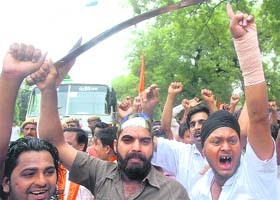 Sikhs here are now demanding that the state revenue department turn down the request to regularise the properties. Some of them had even threatened to form special squads to attack the ashram, following which the security had been tightened. At a reception hosted in his honour last evening by Pakistan high commissioner to India Shahid Malik, he said, the two countries must hold result-oriented and meaningful dialogue. The environment was conducive for progress on outstanding issues and the two countries should grab the opportunity, failing which both would be losers. ”It is possible to resolve Siachen and Sir Creek issues…it is doable,” said the Pakistani minister, who had to cut short his three-day visit to India and return home in view of the death of his mother-in-law. Giving examples of the Eruopean Union and ASEAN, he underlined that the two countries needed to build on commonalities to tap the huge potential that had remained unexploited for 60 years. All political players and the people in both countries were supporting the peace process. This was the right environment to move forward. Qureshi, who met Prime Minister Manmohan Singh and held official-level talks with external affairs minister Pranab Mukherjee earlier yesterday, said Pakistan had a strong desire to move forward and wanted result-oriented and meaningful dialogue with India. He favoured liberalisation of the visa regime and promotion of trade, saying these measures could benefit people of both countries. He said the two nations should cooperate in energy sector in view of rising oil prices and in this regard pressed for early implementation of the Iran-Pakistan-India (IPI) gas pipeline project. Qureshi also emphasised the need for peace and stability in South Asia for economic and social development of the region. Highly placed UPA sources said the Centre was monitoring the situation “very closely” but there was very little which could be done in this case. Anticipating the chain of developments, the Centre expects that after the PDP pull-out Chief Minister Ghulam Nabi Azad will be asked to prove his majority on the floor of the House. “Let’s see what happens in that situation,” remarked a senior UPA minister, adding that in any case Assembly elections were due in the state in September. Ruling out an early election because of the logistics involved, the UPA sources said it was possible that the present dispensation may continue as a caretaker government if it loses the trust vote. Prime Minister Manmohan Singh was kept abreast of the situation by officials and Prithviraj Chavan, minister of state in the PMO, who, in turn, was in constant touch with the Chief Minister through the day. Congress president Sonia Gandhi was also briefed about the day’s developments. Ever since Azad took over as Chief Minister from the PDP relations between the two coalition partners had been under severe strain. “The PDP was waiting to dissociate from the Congress,” remarked an AICC office-bearer. In this case, it was stated, the PDP had painted itself in a corner over the government’s controversial decision to transfer of 100 acres of forestland for developing facilities for Amarnath pilgrims as the environment and law ministers, who were instrumental in passing these orders, belong to the PDP. There were serious misgivings in the Congress about the PDP pull-out, especially since the party president had herself invested a lot in this partnership at the time of the last Assembly elections. With the BJP stoking communal passions on the issue, there is a fear in the Congress camp that militants will occupy the space vacated by the PDP, which had acted as an effective buffer against them. He was releasing the ‘India Corruption Study 2007’ compiled by the Transparency International India (TII) and the Centre for Media Studies. Ansari said the report had clearly highlighted three broad aspects: Corruption, in its moral dimension, cuts at the very roots of the social and political fabric of society and increases injustice; In its legal implications, corruption results in disregard for the rule of law; And in its developmental aspect, corruption tends to distort the decision-making processes on investment projects and other commercial transactions and is wasteful of resources. The Vice-President observed that there was always an air of expectation about annual reports. “Sometimes they add to our knowledge, at others reiterate the evident. The contents, again, may cause delight or dismay, or, occasionally, a bit of both! The India Corruption Study 2007 falls in the latter category,’’ he added. However, the good news was that inch by inch, year by year, there was greater transparency about the way the country was being governed. The bad part was that the level and extent of misgovernance was horrifying in legal and moral terms. Ansari said the study revealed that about one-third of Below Poverty Line (BPL) households paid bribes to avail one or more of basic and need-based public services. Nearly the two-thirds of BPL households could not avail of the PDS, school education and electricity as they could not pay the bribe or use contact or influence to avail of the service. In his address, Admiral R. Tahiliani, chairman of the TII, said the kind of corruption the country was witnessing denied people their entitlement to basic and need based services, many of which may be ‘free’ by law, resulting in the poor finding themselves at the losing end of the corruption chain. Dr N. Bhaskara Rao, chairman of the CMS, said the study surveyed 22,728 households across the states throughout the country adopting the perception, experience and estimation (PEE) model. Justice K Narayana Kurup, head of the board, said the quantum of relief was decided keeping in view the spiralling inflation, which stood at 11.42 per cent, and the demand by the employees for up to 65 per cent hike. The decision on the relief was taken at the fourth meeting of the board here today. Justice Kurup said he would submit the recommendations to the government later in the day. “We are of the considered view that the ideal situation would be that the employees are given an interim relief of 30 per cent from January 2008 when the government made the reference to the board,” he said. “ We need more such linkages between scientific research and rural technology deliveries for the betterment of the people in the remote areas,” Chidambaram said. The spring recharging project started at his initiative four years ago by the Bhabha Atomic Research Centre (BARC), with Himalayan Environmental Studies and Conservation organisation (HESCO), a voluntary group In Rudraprayag district to recharge dried up springs in the mountains has been a success. As many as 16 springs that had dried up were recharged using the BARC technology in Rudraprayag district of Uttarankhand. It was four years ago that Chidambaram, who once headed BARC had asked the scientists to solve the problem of water recharging of springs. He himself went all the way to Golthir village in the Gauchar area of Rudraparyag district to see the experiment done by BARC scientists. It was for the first time that scientist of BARC using isotope hydrology technology were able to recharge nearly 16 water sources, which had virtually gone dry leading to severe water crisis in the area. Using latest isotope hydro geo-chemical techniques, the scientists worked tirelessly to track the origin of the dried spring on the slopes of the hills. Once the origin and route were traced, scientists built bunds so that water would start percolating within the earth. Once this happened, the spring got recharged in the village downstream. “We should be able to recharge fresh water sources in the Himalayas as the global demand for fresh water is going to increase in the coming times. Moreover, the local population dependent on these water sources should benefit from the latest technology,” Chidambaram added. At a briefing on the HESCO campus here today Chidambaram was told that the water discharge in the dried spring had risen to 16 litres per minute from a scanty 2 litre per minute with the new techniques. “This is a significant development which will not only go a long way in preserving and recharging water but will help hill villagers in agriculture and provide them with drinking water facilities,” Dr Anil P. Joshi of HESCO said. Under the project, “Radar approach to predict soil erosion for disaster management”, the focus by IIT researchers will be placed on the development of algorithm for soil erosion with radar approach in laboratory and the validation of developed algorithm in the field. Given the fact that for most of the world’s regions, accurate estimates of soil erosion are not available, researchers here believe that keeping this in mind technologies to estimate, manage and contain soil erosion are very much needed to help prescribe management practices so as to maintain existing terrain in an ecologically healthy state and to return degraded terrain to a more pristine condition. “Soil erosion is the main cause of the occurrence of landslides, which is defined as an outward and downward movement of the slope-forming material, composed of natural rocks, soil, artificial fills etc. There are a number of reasons and causes that are responsible for triggering soil erosion and consequently landslide activities in the region. Therefore, continuous monitoring of soil erosion and landslide process is necessary that may be helpful in this type of disaster mitigation and management programme,” maintains an IIT researcher. It also speaks volumes for the inadequate neurological care in the country and the burden on individual neurologists in the public and private health sector to deal with a range of neurological conditions, including headache, epilepsy, head trauma complications, stroke, Parkinson’s disease, Alzheimer’s disease and HIV neuro AIDS. Dr M.M. Mehndiratta, organising secretary of the12th Asian Oceanian Congress of Neurology (AOCN) and secretary of the IAN, says countable neurologists - around 22 in Sri Lanka and around 100 in Pakistan - are also a cause of concern. He says the neurological case load in the West is lighter and the neurologist-patient ratio is satisfactory as compared to India. This enables neurologists in Europe, UK and USA to provide specialised care to patients. Apart from the issues pertaining to patient care, the controversial topic ‘Stem Cell Transplantation- Hope or Hype’ is expected to be taken up at the AOCN and the 16th annual conference of the IAN scheduled from October 23 to 26 here. Former President A.P. J. Abdul Kalam is expected to inaugurate the meeting. The trouble broke out after some people tried to take over the land belonging to Pintoo and Ankit Choukse yesterday claiming it to be the property of Jama Masjid, Superintendent of Police D K Dixit said. He said when the Choukses and other Hindus living in the area protested, a mob gathered around and indulged in heavy brick-batting, prompting a police team to rush to the area. The incident occurred on Friday night at around 2250 hrs, a Jet Airways official said today. “The pilots have been given instructions to overshoot the runway in such cases. One aircraft took longer time to clear the runway due to which another flight, which was in sequence could not take off. Consequently, our pilot had to overshoot the runway,” the official said. The next step will be to relocate two female tigers after the male tiger has settled down. In the first phase, six tigers - two males and four females- will be relocated to Sariska through a plan designed by the NTCA and the WII, lasting around six months. The move is being seen as a path-breaking effort by the government to revive tiger population in the 881 sq-km area of the Sariska reserve, which lost all its tigers to poaching in 2004-05. However, wildlife experts are doubtful about the Part-II that will follow relocation. Wildlife expert P.K. Sen said there was no doubt that relocation, an entirely technical issue, had been immensely successful.